The UroLift System uses a revolutionary approach to treating BPH that lifts and holds the enlarged prostate tissue out of the way so it no longer blocks the urethra. It is the only transurethral BPH treatment that does not require ongoing medication, heating, cutting or removal of the prostate tissue. Treatment with the UroLift System typically takes less than one hour and does not preclude future UroLift System treatments, TURP, or laser procedures. 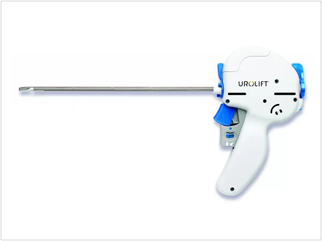 UroLift Delivery Device: inserted transurethrally through a rigid sheath under cystoscopic visualization to reach the targeted area of obstruction. Each delivery device contains one UroLift Implant. UroLift Implant: the obstructing prostatic lobes are held apart by small permanent UroLift Implants that are deployed by the delivery device. 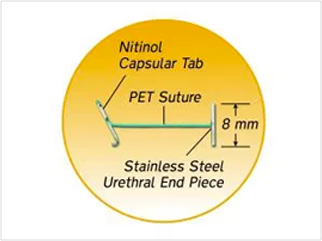 Each implant is made with common implantable materials: nitinol, stainless steel, and PET suture. Typically, four implants are placed into the prostate. Maximum MR system reported, whole body averaged specific absorption rate (SAR) of 4 W/kg for 15 minutes of continuous scanning (i.e., per pulse sequence) (First Level Controlled Operating Mode). Under the scan conditions defined above, the UroLift Implant is expected to produce a maximum temperature rise of 2.4°C after 15 minutes of continuous scanning (i.e., per pulse sequence). The safety of the delivery system has not been evaluated in the MR environment, and therefore, the delivery system should not be used within the MR environment.